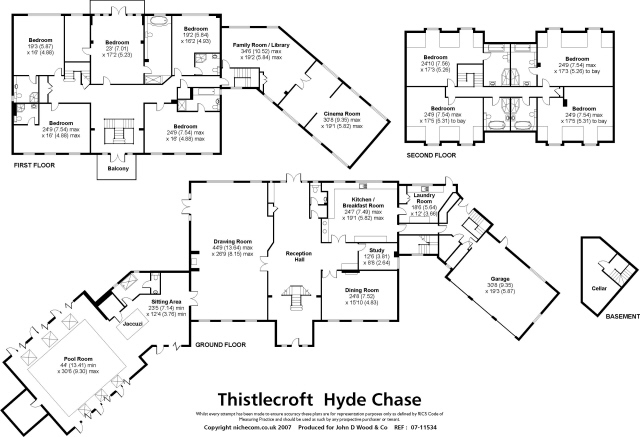 Thistlecroft is a newly constructed luxury country house for sale of extensive size and proportions in a rural setting in the beautiful picturesque village of Danbury, built to a high specification and within a secluded plot with mature and landscaped gardens of approximately 4 acres. 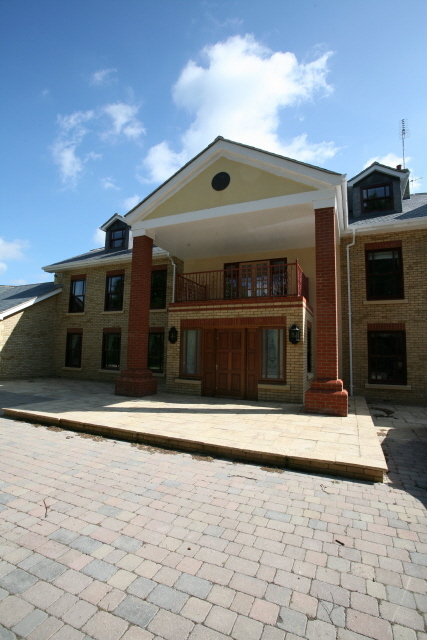 This property qualifies for entry in the 2007 NHBC Housebuilders Award and has been nominated in its category. 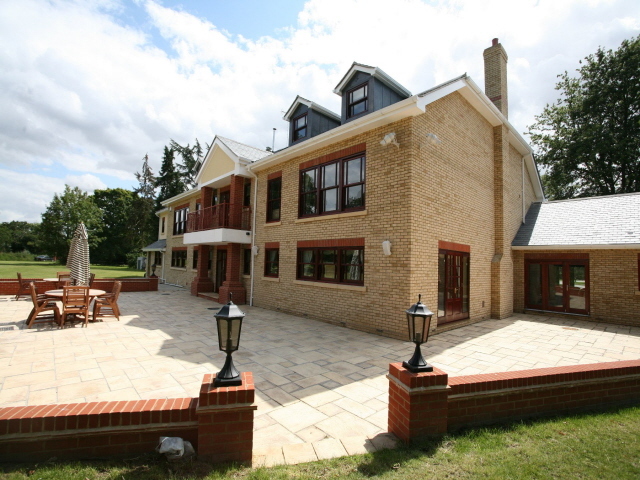 No other new build property in the South East of England can match the Size, Quality and design excellence of this property which is a once off home. Impressive indoor swimming pool complex with Jacuzzi and steam room. 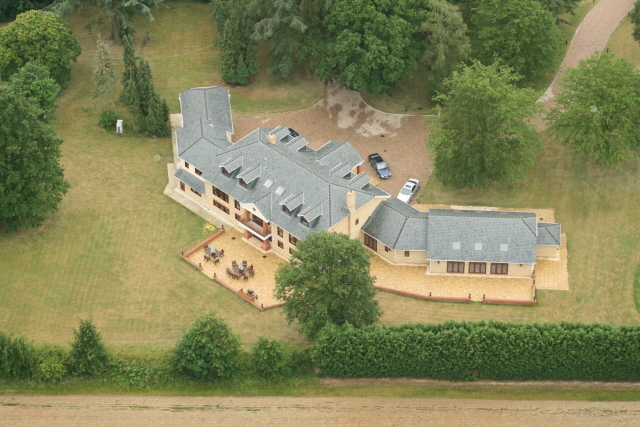 Underfloor heating to ground, first and second floors. 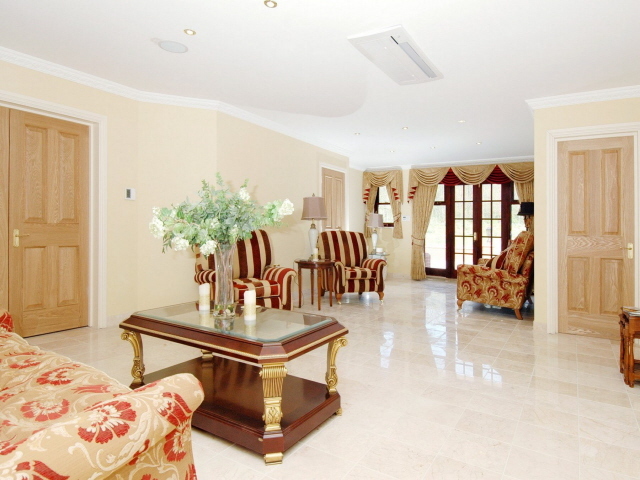 and you can take a Virtual Tour of the House from both the Inside and Outside. 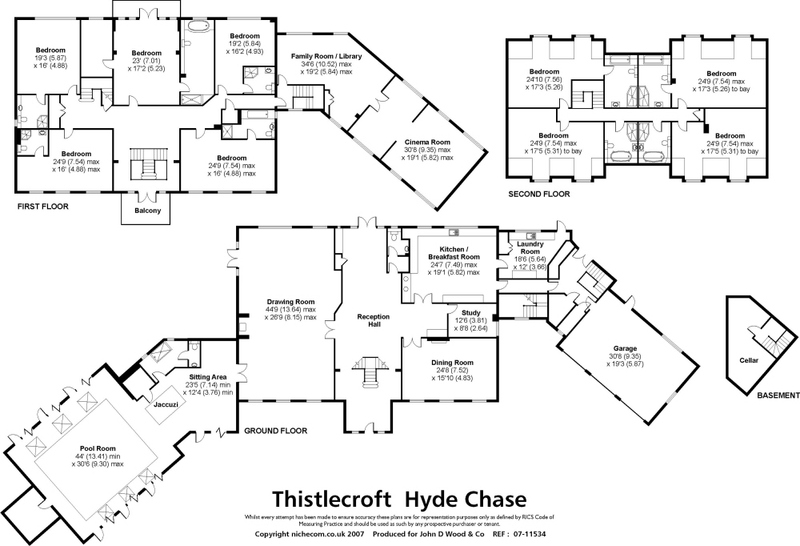 Thistlecroft is believed to be one of the most prestigious properties recently constructed within the South East. 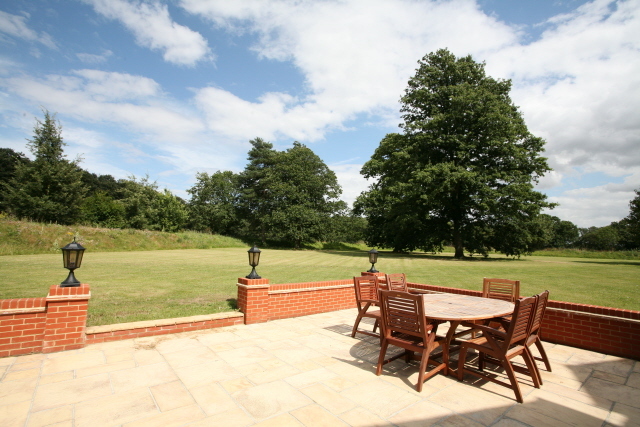 It occupies an idyllic site of approximately 4 acres and has an established plot with many fine mature trees and with recently landscaped open lawns and a pond. 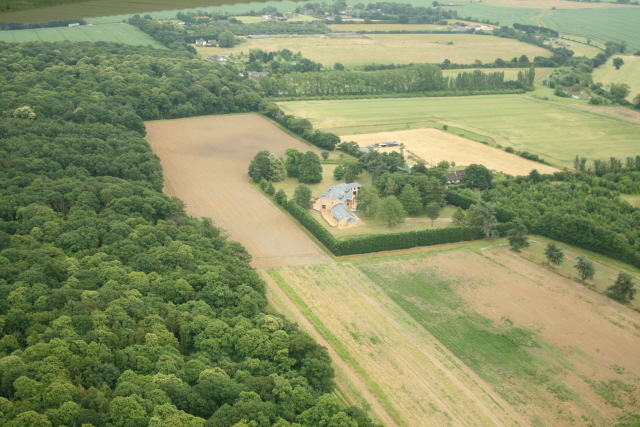 These gardens border onto farmland which in turn border woodland providing a peaceful and secluded setting. 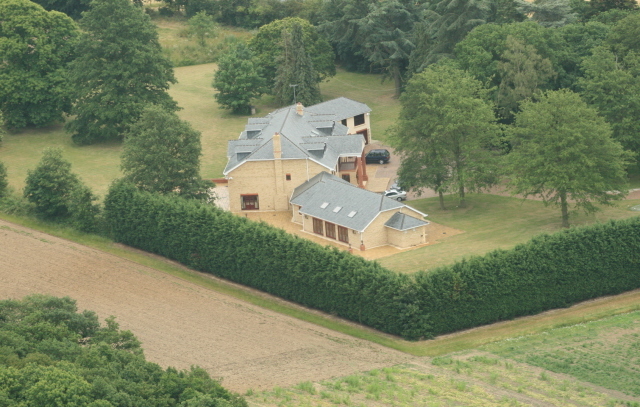 Hyde Chase is a private lane affording access to only a few properties. 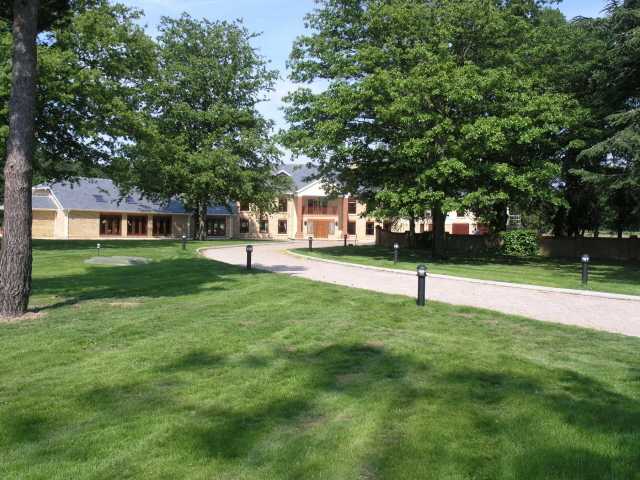 There are a number of renowned golf courses within the area these include Three Rivers Golf and Country Club, Benton Hall, Chelmsford Golf Club, The Warren and Bunsey Downs, Channels, Crondon Park and Stockbrook Manor Golf and Country Club. Local Point to Point races at Good Easter and Marks Tey and a soon to be opened race course at Great Leighs. Sailing facilities on the Rivers Blackwater and Crouch. 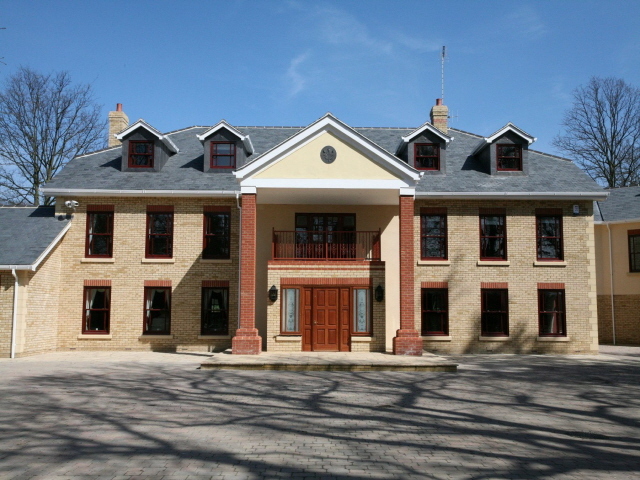 The nearby village of Danbury offers an excellent range of local facilities with local shops and renowned schools these include two Private Primary Schools namely Elm Green and Heathcote as well as Danbury Park Primary School. There are excellent bus services to Chelmsford, Westcliff and Southend Schools as well as Felsted School from the village centre. The county town of Chelmsford is approximately 7.5 miles and offers an extensive range of shops and recreational facilities again benefiting from renowned schools these include King Edward, Chelmsford County High School and New Hall. For the commuter there is an excellent mainline service from Chelmsford to London Liverpool Street (approximately 35 minutes). There are alternative mainline stations at Hatfield Peverel and Ingatestone. The A12 provides a dual carriageway link to the M25 and London. The M25 in turn has links to the City and all London Airports including Stansted. 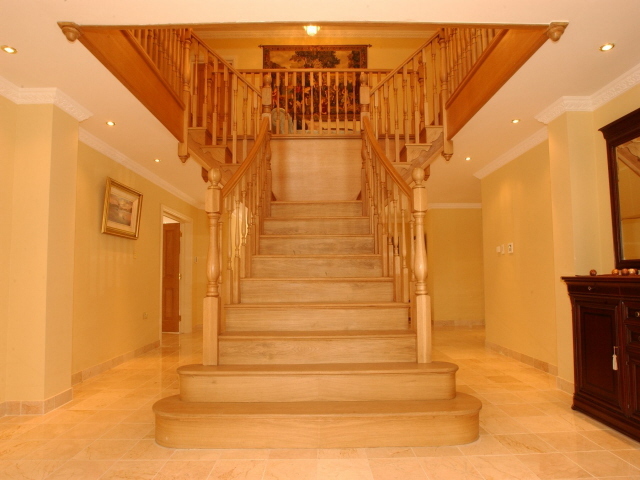 A wide oak panelled front door leads into the reception hall, an impressive 52’8 x 17’2 hallway with seating area to the rear and a magnificent oak staircase with curved banister rails dividing to the gallery landing above. French doors lead out to the rear terrace and to one side a cloakroom with matching marble floor tiles and with wc and wash basin. 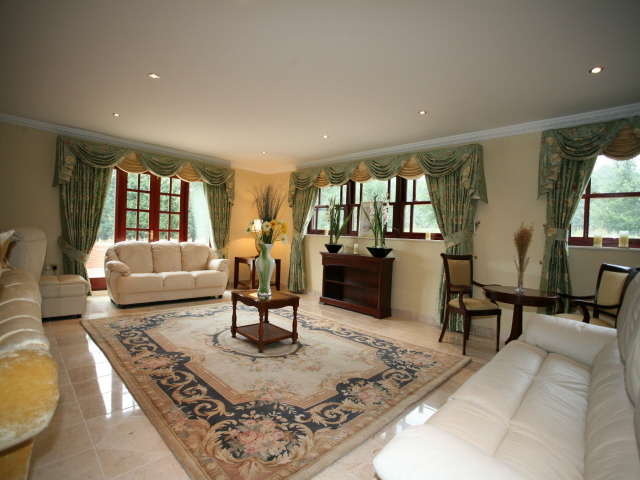 Double doors lead into the extremely spacious drawing room with a central feature being an Inglenook style fireplace with oak bressumer and marble tiled hearth, marble floor tiles and French windows onto the rear terrace. Double doors lead through to the swimming pool complex. The dining room is accessed off a main reception hall through double doors and includes a Minster style stone fireplace with granite lining. 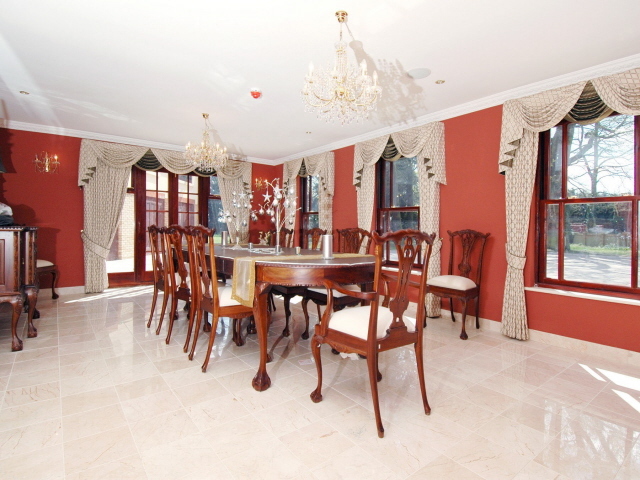 French doors and marble flooring. Study with broadband connection and marble flooring. Further double doors from the reception hall lead into the open plan kitchen/breakfast room with marble flooring throughout and with windows looking out to the rear garden and farmland. 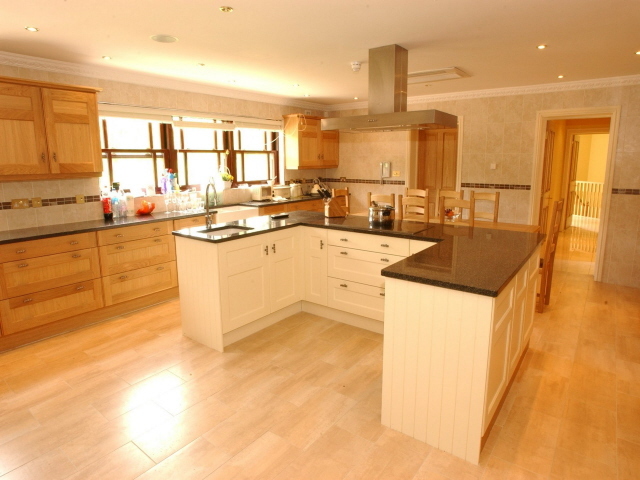 The kitchen includes long granite worktops with oak fronted units and wall cabinets. 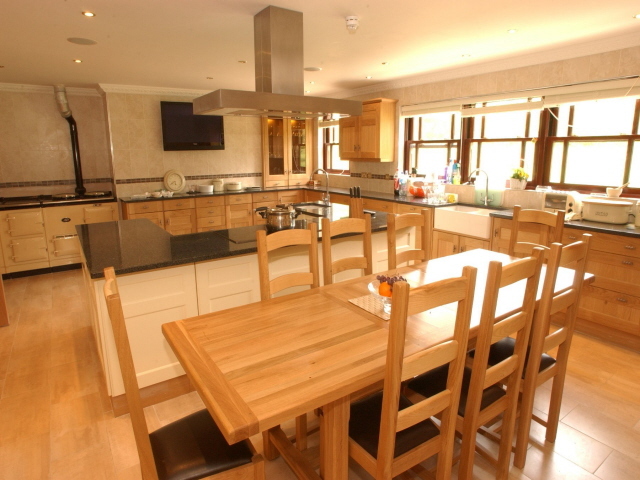 There is a six oven oil/electric Aga, Miele dishwasher, U-shaped island unit with further granite top, halogen hob with stainless steel extractor hood above, wine cooler, two Miele fridge freezers, Neff microwave oven, coffee machine, two sinks (one set into the central island). Laundry Room extensively fitted and including thick wooden worktops with white painted units beneath and including a dresser unit and butler sink, plumbing for washing machine and tumble dryer. Walk-in pantry cupboard. Door to rear terrace. A hallway leads to a secondary staircase leading up to the first floor and onto a rear porch, this gives access out to the rear terrace and to boiler room, tank room, the three garages and also a staircase leads down to the cellar 24’ (maximum) x 12’2 (maximum regular shape). 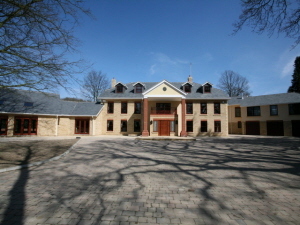 A purpose built wine cellar. 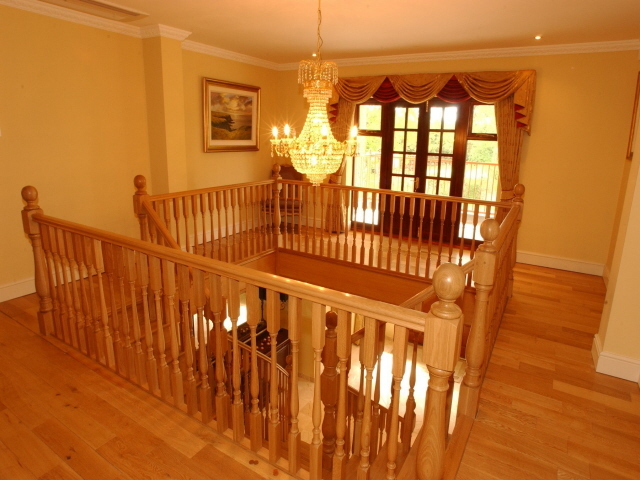 A elegant dividing oak staircase leads up to the spacious galleried landing area with French doors onto the front balcony, oak flooring, cupboard housing Opus music equipment. 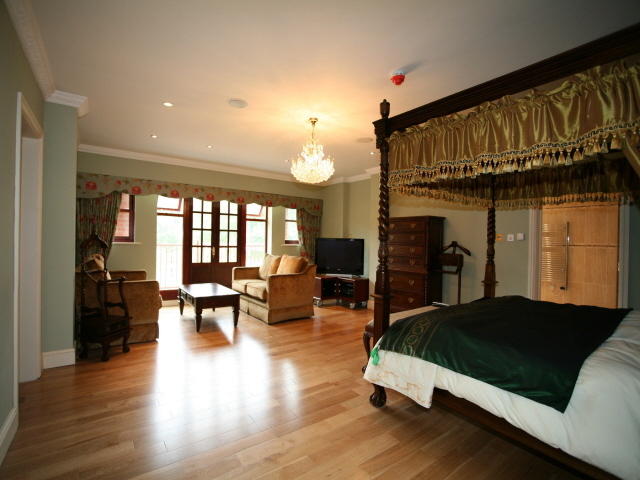 Master Bedroom Suite with oak flooring and with French doors leading out to the rear balcony enjoying views of the garden and farmland. Adjoining dressing room and luxury en-suite bath/shower room including twin sinks and Jacuzzi bath, wc and tiled shower area. 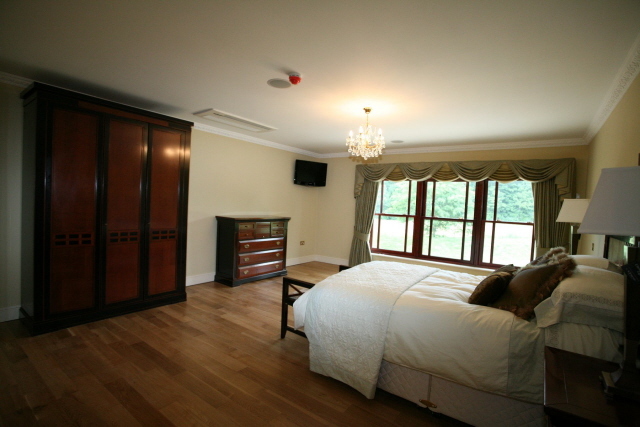 Bedroom Two with oak flooring and with views to the rear and en-suite bathroom with Villeroy and Boch suite and tiling. Bedroom three, southerly outlook, oak flooring and with adjoining fully tiled en-suite shower room. Bedroom four, oak flooring and having a southerly aspect and adjoining en-suite bath/shower room with wash basin, wc and fully tiled walls and floor. Bedroom five, with garden and farmland views and with oak flooring and fully tiled en-suite shower room with wash basin and wc. 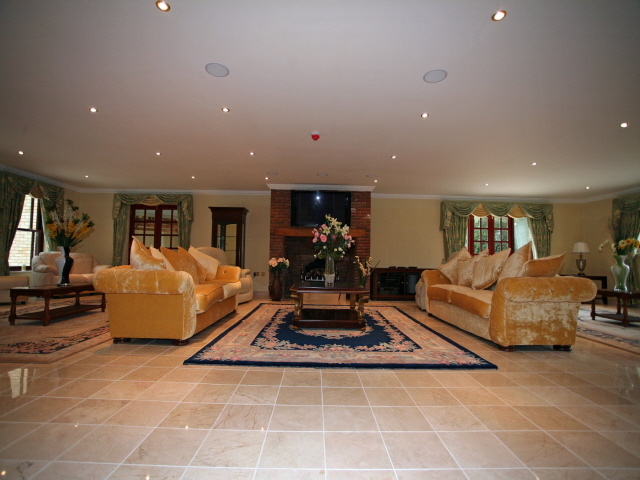 Family Room/Library or Games Room. 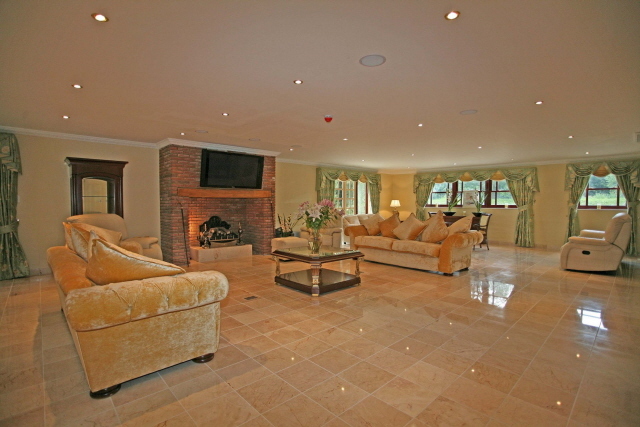 This room which accomodates up to 12 people can be flexible in its use and has oak flooring and an outlook to the rear, double doors lead through to the cinema and exercise room. 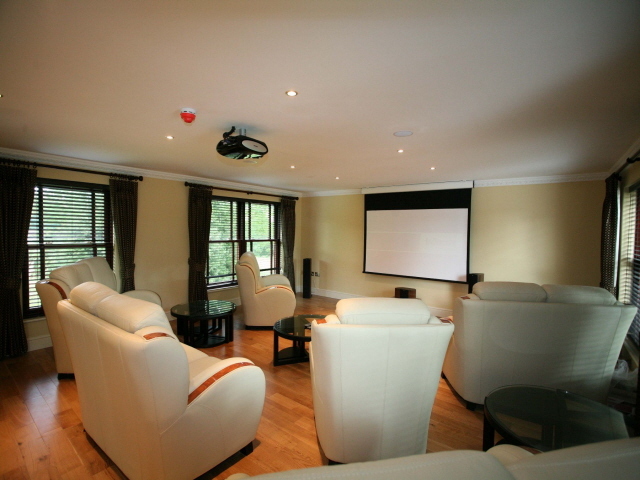 The cinema room includes an Infocus projector system with Kef surround sound and can seat up to 30 peopl, Oak flooring. Bedroom six with oak flooring, dormer windows and adjoining fully tiled en-suite bath/shower room with wash basin and wc. 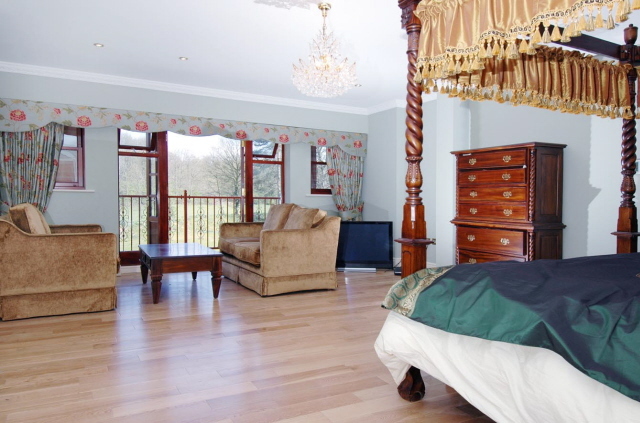 Bedroom seven with southerly aspect, oak flooring. Family Bathroom/Shower room being fully tiled and fitted with a Villeroy and Boch suite with bath/shower, wc and with oval basin. 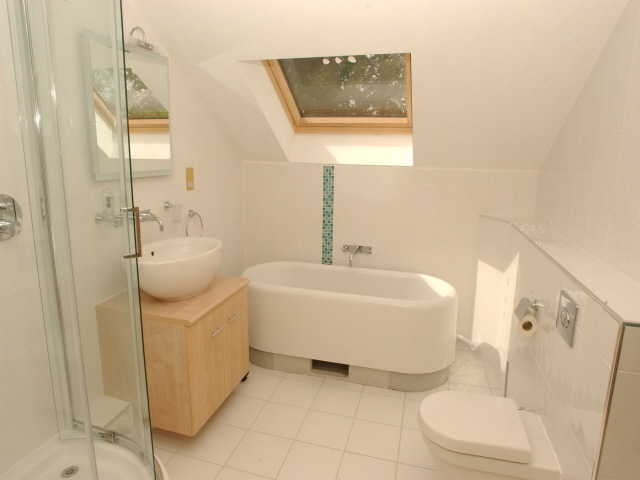 Family Bathroom with stand alone roll top bath, wc, shower cubicle, wash basin. Bedroom eight with oak flooring and with outlook to the rear and with adjoining en-suite bathroom/shower room with wash basin and wc. Bedroom nine with oak flooring and with southerly aspect. 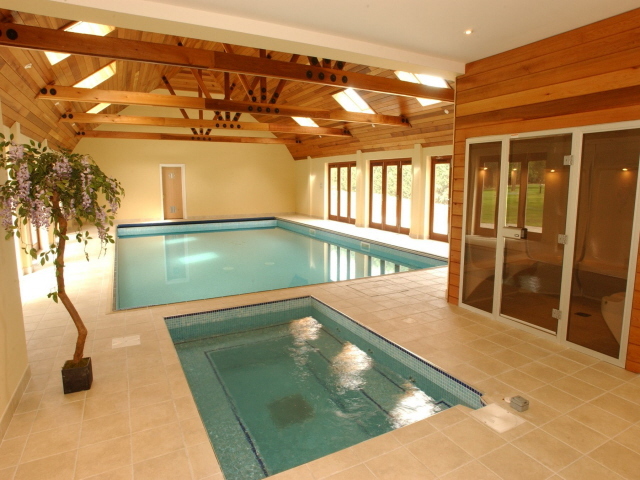 The Swimming Pool Complex is approached from the Drawing Room and is an extremely impressive hall with vaulted ceiling with Cedar tongue and groove and with exposed rafters and skylights. The tiled pool is surrounded by a flagstone terrace and includes a jet system, lighting and with electric security cover. A terrace to one end includes a sunken Jacuzzi and seating area. 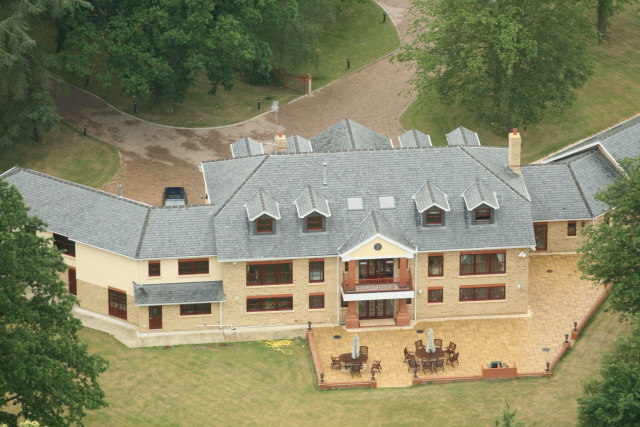 Six sets of double doors open out to the front and rear terraces. There is a seven seater steam room, changing room with shower and adjoining cloakroom, pool house including boiler, heat exchanger and filtration systems. 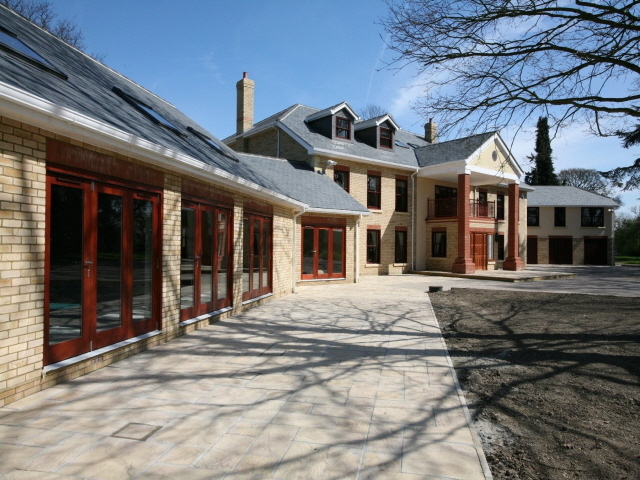 The east wing of the house includes three open plan garages with electrically operated doors and with direct access into the house. Thistlecroft is approached by two driveways off the lane which have double electrically operated gates with video entry systems. 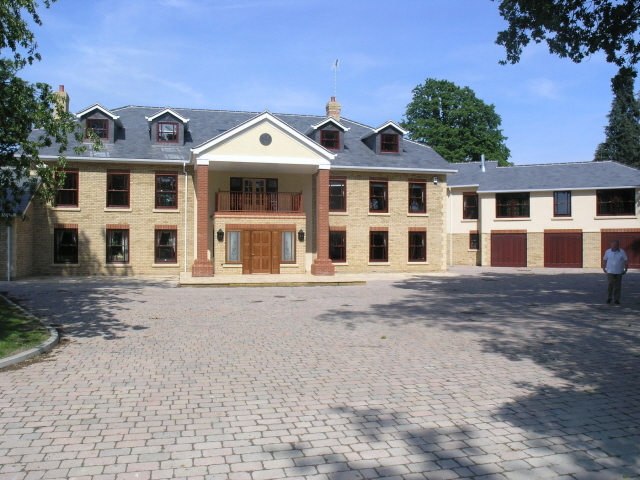 The drives are block paved and lead up to the house and garages providing an extensive parking area to the front of the property. 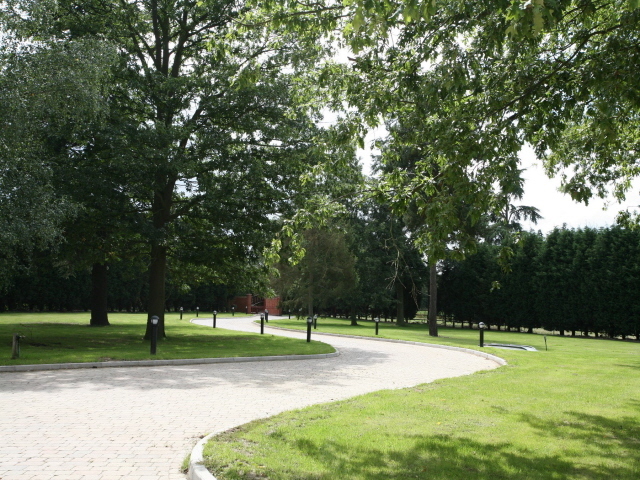 The driveways are bordered by lighting as well as lawns which include attractive mature trees. 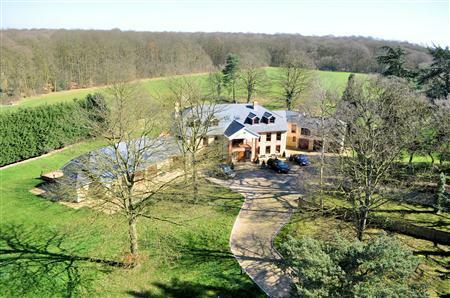 The lawns extend around the house and include a sunken pond, mature trees to the boundaries which border onto farmland at the rear. 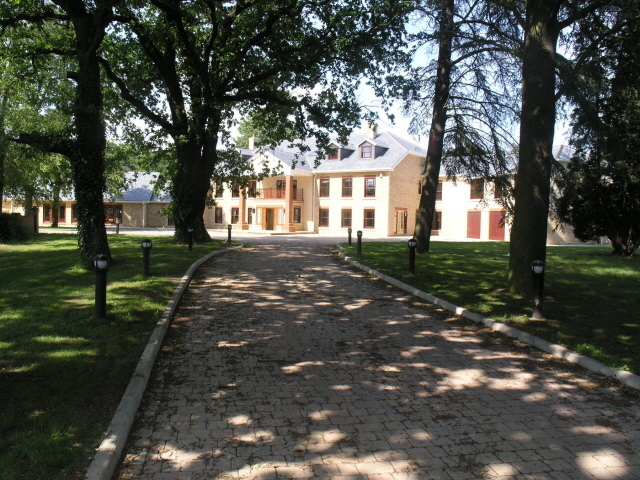 There are wide flagstone terraces with a barbeque area which extend around the rear of the house to the Swimming Pool Complex. 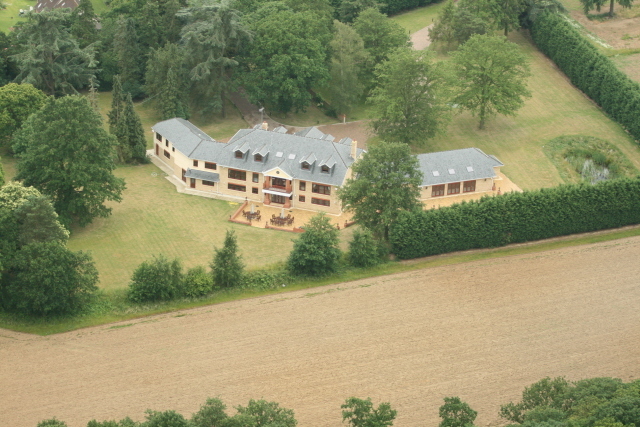 In all the grounds extend to approximately 4 acres. Villeroy and Boch sanitaryware to all bathrooms. Sophisticated zoned internal Opus sound system and surround sound cinema.